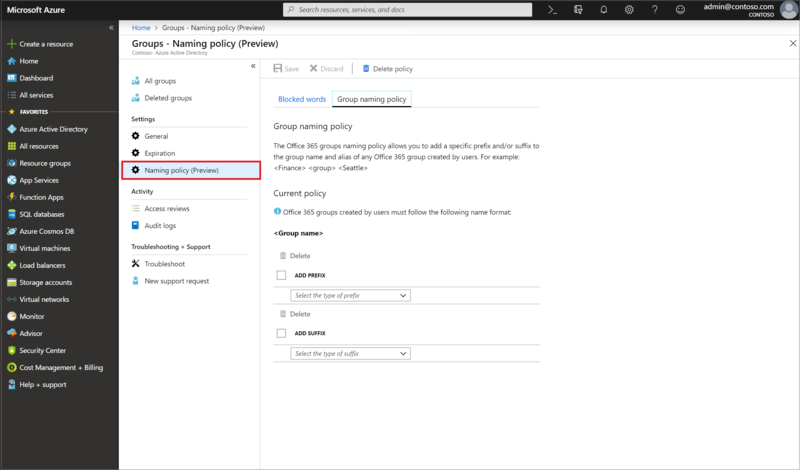 To enforce consistent naming conventions for Office 365 groups created or edited by your users, set up a group naming policy for your tenants in Azure Active Directory (Azure AD). For example, you could use the naming policy to communicate the function of a group, membership, geographic region, or who created the group. You could also use the naming policy to help categorize groups in the address book. You can use the policy to block specific words from being used in group names and aliases. Using Azure AD naming policy for Office 365 groups requires that you possess but not necessarily assign an Azure Active Directory Premium P1 license or Azure AD Basic EDU license for each unique user that is a member of one or more Office 365 groups. The naming policy is applied to creating or editing groups created across workloads (for example, Outlook, Microsoft Teams, SharePoint, Exchange, or Planner). It is applied to both the group name and group alias. 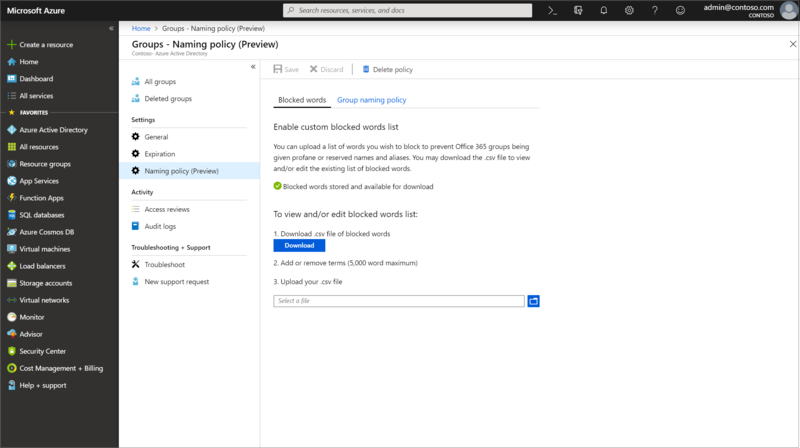 If you set up your naming policy in Azure AD and you have an existing Exchange group naming policy, the Azure AD naming policy is enforced in your organization. The general structure of the naming convention is ‘Prefix[GroupName]Suffix’. While you can define multiple prefixes and suffixes, you can only have one instance of the [GroupName] in the setting. The prefixes or suffixes can be either fixed strings or user attributes such as [Department] that are substituted based on the user who is creating the group. The total allowable number of characters for your prefix and suffix strings combined is 53 characters. Prefixes and suffixes can contain special characters that are supported in group name and group alias. Any characters in the prefix or suffix that are not supported in the group alias are still applied in the group name, but removed from the group alias. Because of this restriction, the prefixes and suffixes applied to the group name might be different from the ones applied to the group alias. You can use attributes that can help you and your users identify which department, office or geographic region for which the group was created. For example, if you define your naming policy as PrefixSuffixNamingRequirement = "GRP [GroupName] [Department]", and User’s department = Engineering, then an enforced group name might be “GRP My Group Engineering." Supported Azure AD attributes are [Department], [Company], [Office], [StateOrProvince], [CountryOrRegion], [Title]. Unsupported user attributes are treated as fixed strings; for example, “[postalCode]”. Extension attributes and custom attributes aren't supported. We recommend that you use attributes that have values filled in for all users in your organization and don't use attributes that have long values. A blocked word list is a comma-separated list of phrases to be blocked in group names and aliases. No sub-string searches are performed. An exact match between the group name and one or more of the custom blocked words is required to trigger a failure. Sub-string search isn't performed so that users can use common words like ‘Class’ even if ‘lass’ is a blocked word. Blocked words are not case sensitive. When a user enters a blocked word as part of a group name, they see an error message with the blocked word. There are no character restrictions on blocked words. There is an upper limit of 5000 phrases that can be configured in the blocked words list. Selected administrators can be exempted from these policies, across all group workloads and endpoints, so that they can create groups using blocked words and with their own naming conventions. The following are the list of administrator roles exempted from the group naming policy. Select Groups, then select Naming policy to open the Naming policy page. On the Naming policy page, select Group naming policy. You can view or edit the current prefix or suffix naming policies individually by selecting the attributes or strings you want to enforce as part of the naming policy. To remove a prefix or suffix from the list, select the prefix or suffix, then select Delete. Multiple items can be deleted at the same time. Save your changes for the new policy to go into effect by selecting Save. On the Naming policy page, select Blocked words. View or edit the current list of custom blocked words by selecting Download. Upload the new list of custom blocked words by selecting the file icon. Be sure to uninstall any older version of the Azure Active Directory PowerShell for Graph Module for Windows PowerShell and install Azure Active Directory PowerShell for Graph - Public Preview Release 2.0.0.137 before you run the PowerShell commands. Open the Windows PowerShell app as an administrator. Uninstall any previous version of AzureADPreview. Install the latest version of AzureADPreview. If you are prompted about accessing an untrusted repository, enter Y. It might take few minutes for the new module to install. Open a Windows PowerShell window on your computer. You can open it without elevated privileges. Run the following commands to prepare to run the cmdlets. In the Sign in to your Account screen that opens, enter your admin account and password to connect you to your service, and select Sign in. Follow the steps in Azure Active Directory cmdlets for configuring group settings to create group settings for this tenant. Fetch the current naming policy to view the current settings. Display the current group settings. Set the group name prefixes and suffixes in Azure AD PowerShell. For the feature to work properly, [GroupName] must be included in the setting. Set the custom blocked words that you want to restrict. The following example illustrates how you can add your own custom words. Save the settings for the new policy to go into effect, such as in the following example. That's it. You've set your naming policy and added your blocked words. For more information, see the article Azure Active Directory cmdlets for configuring group settings. On the Naming policy page, select Delete policy. After you confirm the deletion, the naming policy is removed, including all prefix-suffix naming policy and any custom blocked words. Empty the group name prefixes and suffixes in Azure AD PowerShell. Empty the custom blocked words. If the user enters blocked words, they'll see an error message so they can remove the blocked words. Azure Active Directory portals The Azure AD portal and the Access Panel portal show the naming policy enforced name when the user types in a group name when creating or editing a group. When a user enters a custom blocked word, an error message with the blocked word is displayed so that the user can remove it. Outlook Web Access (OWA) Outlook Web Access shows the naming policy enforced name when the user types a group name or group alias. When an user enters a custom blocked word, an error message is shown in the UI along with the blocked word so that the user can remove it. Outlook Desktop Groups created in Outlook desktop are compliant with the naming policy settings. Outlook desktop app doesn't yet show the preview of the enforced group name and doesn't return the custom blocked word errors when the user enters the group name. However, the naming policy is automatically applied when creating or editing a group, and users see error messages if there are custom blocked words in the group name or alias. Microsoft Teams Microsoft Teams shows the group naming policy enforced name when the user enters a team name. When a user enters a custom blocked word, an error message is shown along with the blocked word so that the user can remove it. SharePoint SharePoint shows the naming policy enforced name when the user types a site name or group email address. When an user enters a custom blocked word, an error message is shown, along with the blocked word so that the user can remove it. Microsoft Stream Microsoft Stream shows the group naming policy enforced name when the user types a group name or group email alias. When an user enters a custom blocked word, an error message is shown with the blocked word so the user can remove it. Outlook iOS and Android App Groups created in Outlook apps are compliant with the configured naming policy. Outlook mobile app doesn't yet show the preview of the naming policy enforced name, and doesn't return custom blocked word errors when the user enters the group name. However, the naming policy is automatically applied on clicking create/edit and users see error messages if there are custom blocked words in the group name or alias. Groups mobile app Groups created in the Groups mobile app are compliant with the naming policy. Groups mobile app does not show the preview of the naming policy and does not return custom blocked word errors when the user enters the group name. But the naming policy is automatically applied when creating or editing a group and users is presented with appropriate errors if there are custom blocked words in the group name or alias. Planner Planner is compliant with the naming policy. Planner shows the naming policy preview when entering the plan name. When a user enters a custom blocked word, an error message is shown when creating the plan. Dynamics 365 for Customer Engagement Dynamics 365 for Customer Engagement is compliant with the naming policy. Dynamics 365 shows the naming policy enforced name when the user types a group name or group email alias. When the user enters a custom blocked word, an error message is shown with the blocked word so the user can remove it. School Data Sync (SDS) Groups created through SDS comply with naming policy, but the naming policy isn't applied automatically. SDS administrators have to append the prefixes and suffixes to class names for which groups need to be created and then uploaded to SDS. Group create or edit would fail otherwise. Outlook Customer Manager (OCM) Outlook Customer Manager is compliant with the naming policy, which is automatically applied to the group created in Outlook Customer Manager. If a custom blocked word is detected, group creation in OCM is blocked, and the user is blocked from using the OCM app. Classroom app Groups created in Classroom app comply with the naming policy, but the naming policy isn't applied automatically, and the naming policy preview isn't shown to the users while entering a classroom group name. Users must enter the enforced classroom group name with prefixes and suffixes. If not, the classroom group create or edit operation fails with errors. Power BI Power BI workspaces are compliant with the naming policy. Yammer When a user signed in to Yammer with their Azure Active Directory account creates a group or edits a group name, the group name will comply with naming policy. This applies both to Office 365 connected groups and all other Yammer groups. StaffHub StaffHub teams do not follow the naming policy, but the underlying Office 365 group does. StaffHub team name does not apply the prefixes and suffixes and does not check for custom blocked words. But StaffHub does apply the prefixes and suffixes and removes blocked words from the underlying Office 365 group. Exchange PowerShell Exchange PowerShell cmdlets are compliant with the naming policy. Users receive appropriate error messages with suggested prefixes and suffixes and for custom blocked words if they don't follow the naming policy in the group name and group alias (mailNickname). Azure Active Directory PowerShell cmdlets Azure Active Directory PowerShell cmdlets are compliant with naming policy. Users receive appropriate error messages with suggested prefixes and suffixes and for custom blocked words if they don't follow the naming convention in group names and group alias. Exchange admin center Exchange admin center is compliant with naming policy. Users receive appropriate error messages with suggested prefixes and suffixes and for custom blocked words if they don't follow the naming convention in the group name and group alias. Microsoft 365 admin center Microsoft 365 admin center is compliant with naming policy. When a user creates or edits group names, the naming policy is automatically applied, and users receive appropriate errors when they enter custom blocked words. The Microsoft 365 admin center doesn't yet show a preview of the naming policy and doesn't return custom blocked word errors when the user enters the group name. These articles provide additional information on Azure AD groups.